Happy Monday readers. December has officially arrived and it is cold! The Christmas season is upon us and shoppers are starting to go a little bit crazy. Today I am delighted to announce that SavvyScot is taking part in a $100 giveaway! 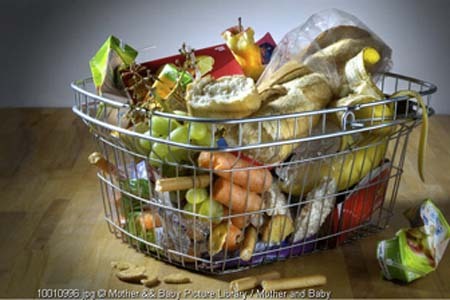 This amounts to approximately 40% of all food that is bought which goes to waste! The UK are not much better than the US – they waste approximately 25% of all food and perhaps more shockingly, produce over twice the volume of required food (i.e. lots of people eat too much as well as wasting food)! As part of this giveaway series, you will notice that there are a variety of different posts looking at different ways to save money on food shopping. The most simple approach would be to simply buy less food! Although trivial, a lot of people cannot master the art of planning their meals. Mrs Scot and I create our menu a whole week in advance; we search the cupboards and freezer looking for inspiration / pre-cooked meals, before making a list of top-up ingredients that we need to buy. We deal with food waste firstly by planning ahead. Although unnecessary in the current sub-zero temperatures in the UK, ensure that you have a decent-sized freezer. If you only have a small freezer box within your fridge, a standalone freezer is a great investment. We keep our freezer stocked with meat (through a combination of bulk-buying at a wholesaler and buying when on special in the shops) and we keep adequate space for additional boxes and bags. We plan meals such that there are always two portions leftover to freeze; We then box up the leftovers and leave to cool. A small tip is to always label boxes clearly so that you know what they contain. There is nothing worse than defrosting something in error and the unwanted food ending up in the bin! Freezing saves both time and money – you can defrost late and will not have to worry about cooking one of your meals next week! This is probably one of my favourite things to do. I have actually noticed that I sometimes deliberately buy some extra vegetables some weeks in order to make the soup of the week more exciting / different. At the end of each week, I throw all the leftover vegetables (and sometimes leftover meals that are not worth freezing) into a pan and slow cook. A few stock cubes later, the concoction is blasted through the blender and we have a beautiful soup for the next week. Mrs Scot often takes these to work, or we will eat it as a starter with an evening meal. Each week, a unique soup is created and can never be copied again! From spag bol and tomatoes to parsnip, apple and lentils – they are almost guaranteed to be good. We follow the above three principles quite closely and quite honestly have very little food waste. So much so in fact, that we only ever put our bin out for collection every other week. This Christmas, I will be making an extra special effort to ensure that we don’t buy too much food and plan our meals. It is extra difficult during the holiday season when you go for spontaneous meals or even skip them altogether. I urge you all to make an attempt to watch your waste too. As cliched as it sounds, just think about those less fortunate than ourselves. Oh I definitely freeze, freeze, and freeze. That’s why one of the first things I got when I moved out on my own was a deep freeze. Worth every penny. Those food waste stats are absurd. I know I definitely don’t waste that much myself. It’s just a matter of checking what’s in the fridge before going shopping and planning a bit. Properly storing food is very important too. By improperly storing food, you can cut the lifespan considerably. You raise another good point dude… Learning expiry dates and where and how to store is a must! I hate wasting food. With a little creativity you can pimp up leftovers (with something else about to go bad, win-win) and don’t feel like you are eating the same thing twice! I live off leftovers. It allows me to just make and freeze. There is nothing better than getting home from work and not having to cook, just heat and eat! When I was a kid I sadly wasted a lot of food. Sometimes my PB&J sandwich would get smushed and I didn’t eat it because it looked bruised. Parents should really think twice about what they’re sending kids to school with because they won’t eat something they don’t want to if no one is looking over their shoulder. My wife and I eat left overs all the time. It’s just such a time saver to cook a large batch of food and then store it in the freezer to eat at a later date. Having said that – I love freshly cooked food, so I struggle to find a balance sometimes. I’m getting better about not wasting food, but I’m a wreck in the kitchen and have zero creativity, patience, or desire to be the kind of cook who can do amazing things with random things in their fridge or pantry. I’m in awe of people who can! There are so many pf bloggers with this sill. Instead I try to buy smaller amounts but more often. It may be slightly more expensive, but it has cut down my food waste significantly! “This amounts to approximately 40% of all food that is bought which goes to waste!” This stat completely surprised me. It is inexcusable!